Apples (Malus species), forbidden food of Eve and Snow White belong to the Rosaceae (Rose) Family). Apples are rich in flavonoids, beta-carotene and vitamins, B C and the minerals boron, calcium, phosphorus, potassium, and silicon. The tarter an apple is, the higher its Vitamin C content. They are high in pectin, a soluble fiber and reduce colon inflammation, improving both diarrhea and constipation. Eating raw apples stimulate saliva flow, promote good digestion, a healthy liver, clean the teeth and improves circulation to gum tissue. November celebrates the feast of Pomona, Roman goddess of Orchards. Romans exchanged apples then and hence the tradition of bobbing for apples arose. Consumed since ancient times, apples have been considered a gift of perpetual youth to gods and goddesses, like Venus, (aka) Aphrodite, Demeter, and Eve symbolizing love, peace and health. When one cuts an apple in half horizontally, one sees a five-pointed star. Avalon is regarded in Celtic Mythology as the Isle of Apples where the weather is always perfect. In fairy tales, eating an apple together represented the blessings of children. As part of Yuletide rituals, apples were hung from trees to symbolize the continuing fertility of the earth. The expression, “An apple a day keeps the doctor away,” used to read, “An apple a day makes a doctor beg his pay.” Apples are alkaline, cool, sweet and sour, and considered a moistening tonic. Apples taste best when they are in season and are best stored at 35 degrees F. Avoid apples that yield to pressure, indicating they will be mealy. Apple blossoms can be eaten raw in salads and as a garnish, once the bitter whitish heel is removed. Apples can be enjoyed in pies, tarts, sauces, cakes, and salads and juiced. Enjoy dried apples (untreated with the preservative sulfur dioxide) as a snack. For maximum health benefits eat apples in their fresh raw state! Thanks for sharing. I like apple espeacially thrir sweet smell. love apples, thanks for sharing. i like some apples but rarely eat them. If we were going 2 die from apple peelings, we would have died long ago from something in our food.....its no secret the USA has very low standards when it comes 2 food inspection! I watched the video "An Abundance of Apples" and would like you to consider tying your hair back next time you cook. Not only is it more hygienic but surely it would allow you to concentrate more fully on your cooking instead of your appearance. 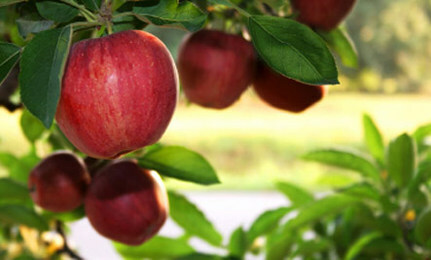 Actually the Bible does not identify the forbidden fruit in the Garden of Eden as an apple. This is a commonly held misconception. Fuji apples are the best! If you don't buy organic apples, be sure to peel them because the pesticide residue will NOT wash off... due to the wax coating that makes them shiny and less likely to be bruised and rot before you buy them. It seals in the pesticide and no amount of washing or scrubbing will remove it all sufficiently.